I was born here and I'm living here for over 30 years now. (Oops! Now you know my age.) Yingge town is famous for its ceramics and porcelain industry. How did Yingge's ceramics become famous? 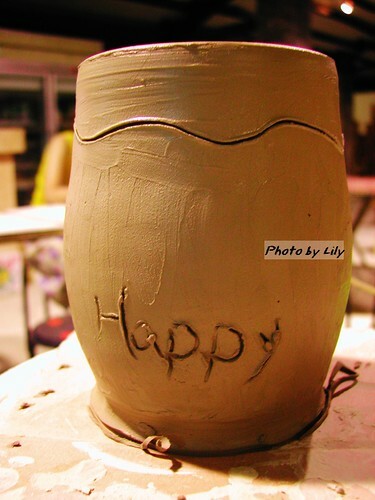 We did not have any ceramicists in my family, but some of my classmates' did have them. When I was a little girl, the industry flourished at that time and a lot of pottery from Taiwan actually came from Yingge town. I remember I liked to pick up some faulty cups and plates near the pottery factories, because the factories would discard the imperfect ones, but the quality of some of those were still good, just the decoration was messed up or the color was not perfect, but apart from that, the ceramic was still good. Finding those faulty cups and plates was like a treasure hunting game for me, it was a lot fun. Once a classmate brought ceramic scissors to class, they were white and delicate. We were all curious about them, so my classmate demonstrated how well they cut a paper. Wow, the scissors were really sharp, the cutting edge of the paper was flawless! And they were very safe to use. If you put your finger on the blade, you'd not cut yourself! However, there was a serious defect: If you were careless and accidentally dropped them, they would break and shatter into pieces immediately. I still don't understand why my classmate's family manufactured those scissors. Because of the ceramics industry, our town was not so clean before. But our government helped to change Yingge into a tourist destination and my home town became beautiful and clean. On November 26, 2000, the Yingge Ceramics Museum was opened. I like it very much, because it looks so nice and it shows the whole ceramics history of Yingge town in form of a collection of all the products throughout from the beginnings some 200 years ago to the present time. Every time my friends ask me to show them around my home town, no doubt I would bring them to this museum, it's my most recommended spot here. Besides the famous museum, I recommend the Old Street. It's a great spot for visitors to walk around. 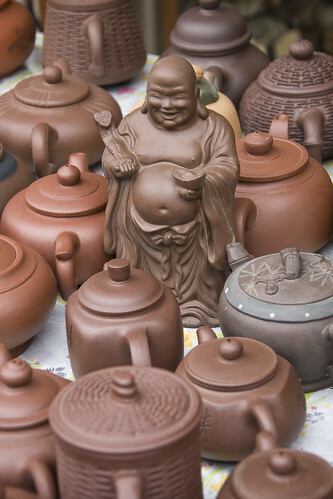 Many ceramic stores located there and they sell all kinds of products, such as tea pots, cups, bowls and plates, even ceramic art. The prices are very reasonable, some are very cheap. Many good restaurants are located there as well and they have a special tradition: If your eat there, you can take away the cups and plates, in which your meal was served, you don't need to pay extra for that. That's great, right? There's another thing for you in Yingge: If you want to experience the famous scene from the movie "Ghost" (with Patrick Swayze and Demi Moore), you can join a clay art course, there's many of them here. 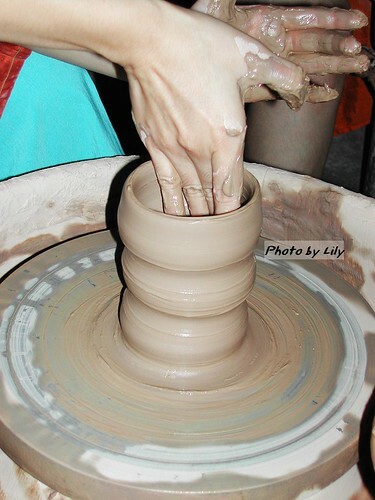 A professional craftsman will assist you in making a perfect plate, cup or bottle by yourself. And if you think your product is good, you can ask them to make it a ceramic for you, it will cost you very little. 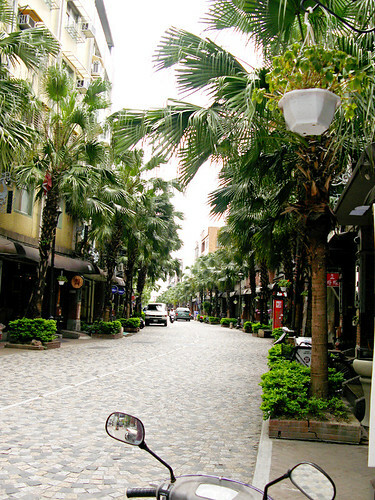 Do you want to go on a short day trip away from Taipei city? Come to Yingge and have a nice day! Welcome to Yingge! have you made a lot of ceramic stuff? Aha, knew your age! XD About the scissors, I'd say WOW! COOL! but then it would be so much cooler if it doesn't break. Of course you should know my real age, right? I'm honest to you. I'll show you my hometown, I know because of lots of tea pots, you'll like it very much. Green tea is healthy, I like to drink it very much!! I don't understand why they made the ceramic scissors, but it's really funny, maybe they made it just for fun. Didn't know there was such a thing called ceramic scissors. I enjoyed Taiwan alot as a whole, its vast culture make it a very unique nation. Looking forward to my Taiwan trip in end April. Can we d.i.y it? I want to get some, for my family. :) Introduce more about TAIWAN pls! :D We like it we like it. i enjoy reading it as well. If we take train, only needs 30 min from Taipei City to our town. Yes, welcome back, better ask me this Yingge and Taiwan local, hehe. Thanks for sharing this post about Yingge. Friends of mine who live in Taipei brought me there last January; otherwise, I probably never would have known about the place. I loved the pottery, but didn't have time to make my own. And as for food, I didn't have any, but I remember being amazed that you could 1) Buy tea in an aluminum can and 2) the 7 Eleven sold the aluminum can from a hot case that keeps the beverage warm. We have no such thing in America at our 7 Eleven stores. I love Google street view for bringing dimension to a place halfway around the world and your description enhances it greatly, too. Thanks for visiting here, your photo makes this post become splendid. I didn't go to America before, so I don't know you don't have teas in aluminum cans. I guess maybe you seldom drink tea, but here we used to drink a lot of tea, that’s the difference. I forgot I can use Google street views, hehe, thanks for the sharing. Yeah, good question. I wonder why ceramic scissors would even sell. They're too fragile to be fully functional. Taiwan is so close to the Philippines and I have some friends who work there. They really love the country. And my friends and I share one other thing in common. We have a crush on Jerry Yen of the F4. Haha. Really? You have such town? What's the town's name? I'm interested.